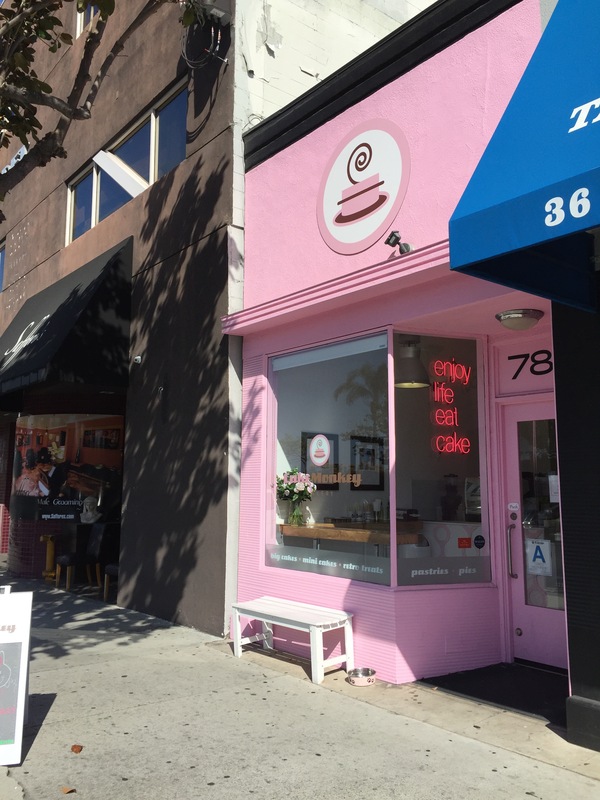 A couple of months ago, someone in our office talked about a new bakery that had opened up in Hollywood/West Hollywood area that was getting a lot of buzz. He had read about it on some food site and we were looking at pictures of their baked goods online and drooling over them. It so happened that he was going to be driving by the area later in the day and said that if he could, he’d stop by the bakery and pick up a couple of items to bring back to the office so that we could sample. Sure enough, true to his word, he came back to the office that afternoon with a box of baked goods that looked oh, so good! And he talked about how cute the bakery was and how all of their stuff looked fantastic. As there were only a few people in the office that day, we all ended up splitting a little bit of each of the baked goods he brought in so that we could sample and we all agreed that not only did it look good, it tasted really good as well. I’m such a sucker for cute bakeries with yummy baked goods that I decided I needed to go down to this bakery myself and check it out. 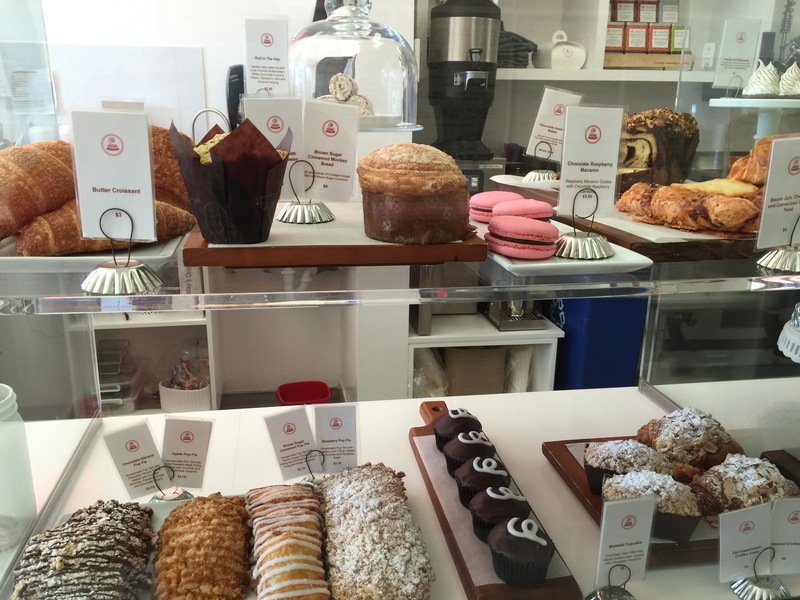 Located not too far from the famed The Grove outdoor shopping center, Cake Monkey Bakery is the brain child of a native New Yorker who has had a life long passion for cakes and old school snack treats but was working as a Producer/Executive in LA’s film and television industry. Lisa Olin always had a dream to create a bakery that created sweet treats that satisfied everyone’s sweet tooth by making old-school cakes and old-school treats that would remind people of their childhood. 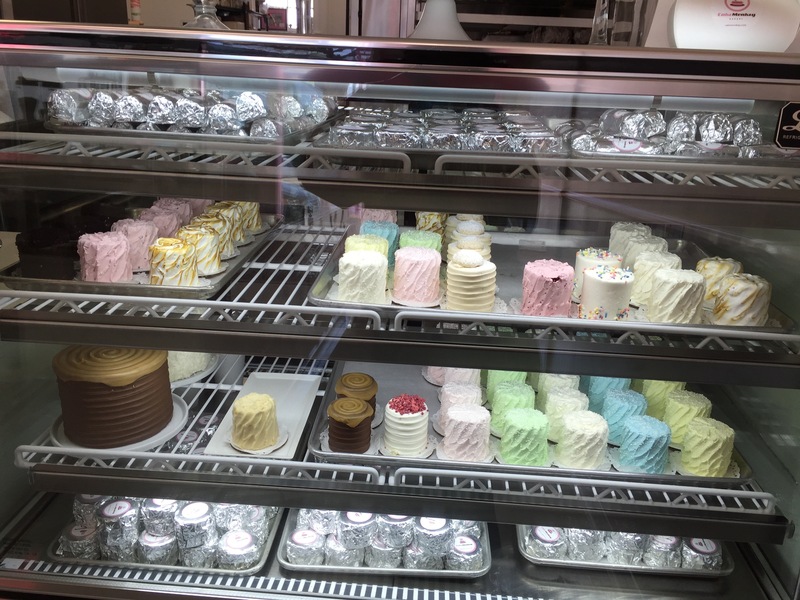 She teamed up with Executive Pastry Chef Elizabeth Belkind and created Cake Monkey Bakery where nostalgic treats such as pop tarts and ding dongs are recreated and the star of the bakery is mini layer cakes in flavors that take you back to yesteryear. 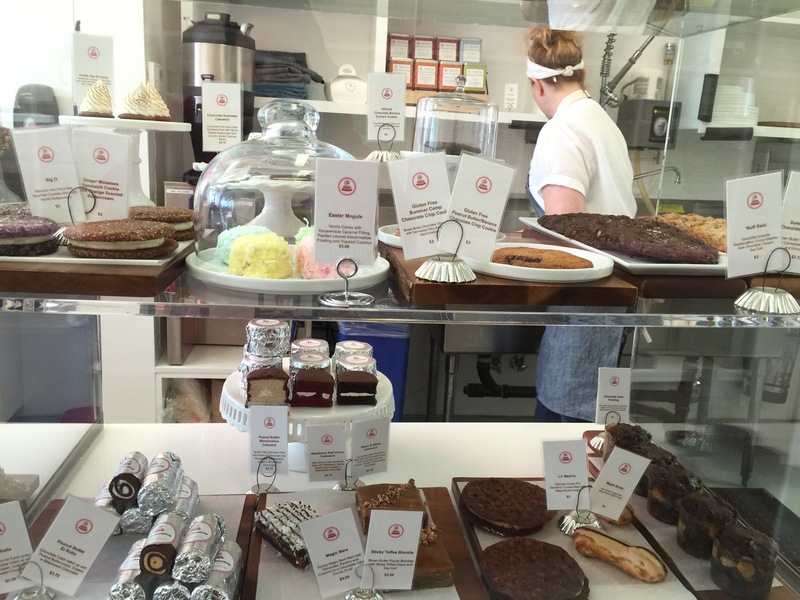 With a cute little storefront, the bakery takes up half the space in the back where these sweet treats are created from scratch on a daily basis. The front of the store is filled with glass cases filled with delectable treats as well as being a small coffee shop as well where coffee drinks are hand crafted. 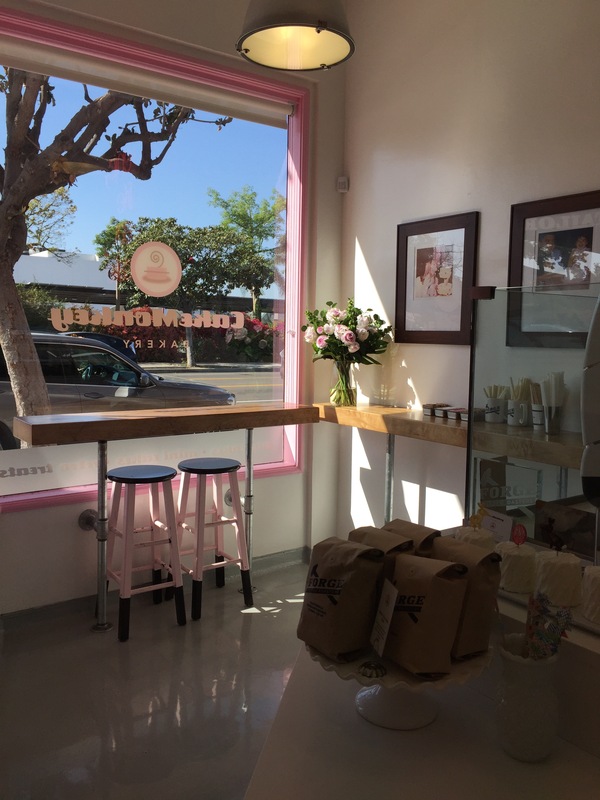 At the very front of the store is a small table top with seating looking out to Beverly Blvd where you can enjoy your coffee and treats with a pretty view. When you first enter the space, you’re bombarded with how clean and bright and beautiful it all is. Then you’re hit with how amazing all the treats look. You know you’re in trouble when each item you see looks more delicious than the previous item, and you already were convinced you wanted that first item. You might as well buy one of everything in the store! You’ve got fresh baked muffins and croissants for a morning breakfast. But there’s so much more. What about a chocolate hazelnut babka? Or a chocolate raspberry macaron? The pop pies, which are Cake Monkey’s version of a sophisticated pop tart features the following flavors: chocolate almond, apple, brown sugar cinnamon and blueberry. 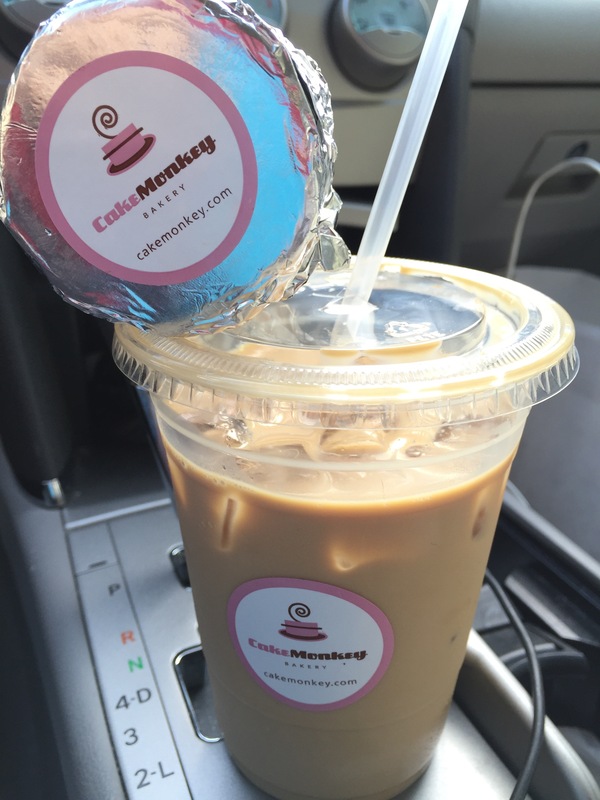 What Cake Monkey calls their Mostest Cupcake is their homemade version of a Hostess cupcake and it looked fantastic! There were also old fashioned coffee cakes and almond croissants. And if you wanted a savory lunch treat they had bacon jam, cheese and caramelized onion twists. Those looked amazing. The next case over contained cookies that looked like whoopie pies. The cookie flavors were ginger molasses with orange scented butter cream or the Big O with Mexican hot chcoolate and vanilla buttercream. There was a pretty chocolate cake pudding muffin or a maple eclair. What about Cake Monkey’s version of a homemade ding dong which they called a cakewich? There were 3 flavors: peanut butter/marshmallow, raspberry red velvet and black & white. And finally, they had homemade rollos as well which they called El Rollo, there was black & white and peanut butter. But it was the case furthest from the front door that most interested me. This is what I came to Cake Monkey for, their mini layer cakes. Cake Monkey makes these nostalgic layer cakes in a mini cake form that basically can fit in the palm of your hand. 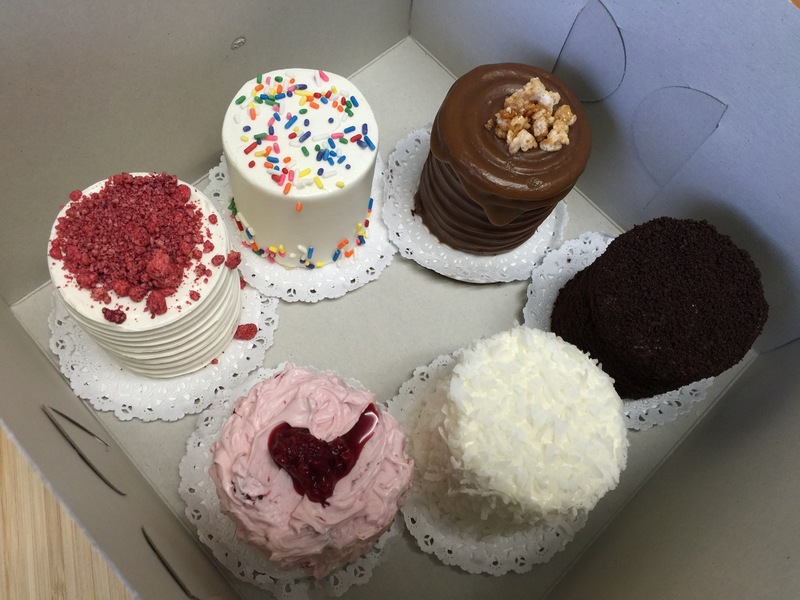 The mini cakes come in a bunch of different flavors that change seasonally and even by the day based upon what is baking at the store. Popular mini layer cake flavors include chocolate caramel cake, must love chocolate, raspberry red velvet, the classic (which is layers of yellow cake with chocolate buttercream frosting), vanilla gorilla, Cake Monkey carrot cake, and coconut cake just to name a few. I arrived a few weeks before Easter so display case was filled with a bunch of pastel-colored Easter mini cakes that were just gorgeous. As I said, the hardest part was making a decision as to what to order since everything looked absolutely delicious. 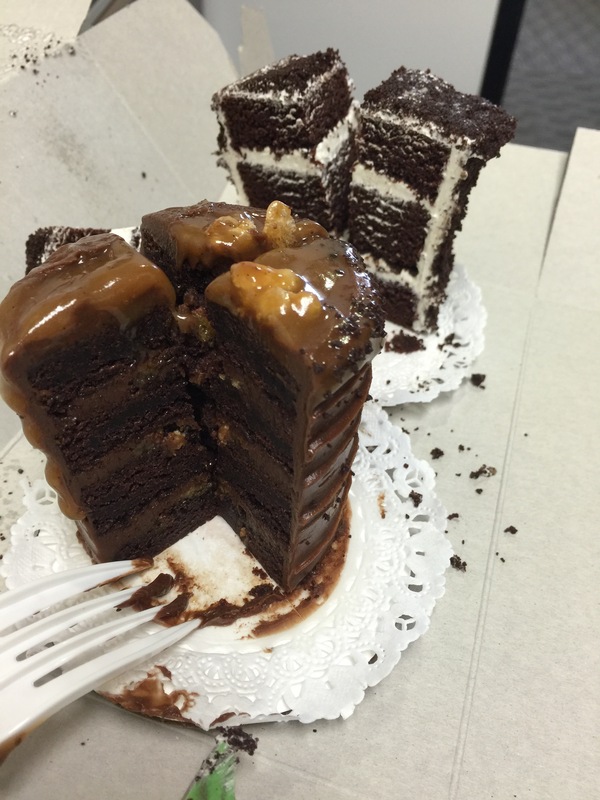 When the person in our office introduced us to the mini layer cakes from Cake Monkey, he brought with him the chocolate caramel cake and black & white cake with him. Since there were so few people in the office this day, we easily cut each mini layer cake into four slices so that we could each sample a small slice of cake. This picture makes the cakes look bigger than they actually are. When cut in fourths, each quarter slice is literally about two-three spoonfuls, if that. So, I knew that when I chose baked goods for myself and my husband, I wanted to try new and different flavors and items. I chose a ginger molasses sandwich cookie filled with orange scented buttercream for my husband. Ginger molasses is a cookie flavor that my husband really likes, and the spicier the better. This large cookie, which was almost like a whoopee pie, was baked with sanding sugar atop the cookie which glistened in the final product. The cookie was slightly spicy, slightly sweet and perfectly chewy. The flavor was terrific. And the orange scented buttercream sandwiched between the two cookies was the perfect flavor compliment to the ginger molasses. The orange scent was subtle, you could smell the aroma of the orange, but the flavor was so subtle that it wasn’t too sweet and it didn’t overpower the flavor of the cookie itself. My husband was quite impressed with this sandwich cookie I picked up for him. Wanting to try one of their adult, homemade pop tarts, I got the chocolate almond pop pie for myself. First off, these were huge, and way better than any pop tart I’ve ever had. The pastry itself was perfectly baked with a slight crunch, but still a bit chewy. The inside the pop pie was filled with a chocolate hazelnut filling which was smooth, creamy and not too sweet or too thick. 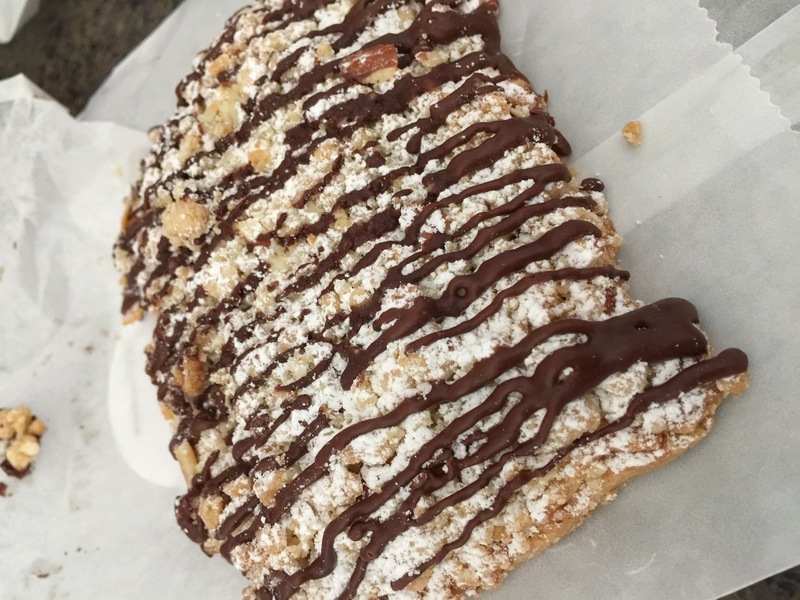 The pop pie was then topped with crumbles, sliced almonds, powdered sugar and chocolate drizzle. As this is a chocolate almond pop pie, the almond flavor wasn’t just prevalent in the slivered almonds, but rather there was an almond flavor – slightly marzipan in taste – in the dough for the pop pie itself. I’m not a huge almond fan, but this was subtle enough that you could taste the almond flavor and you knew there was an almond presence in the dough, but it wasn’t too bad. The crunch of crumbles and the sweetness of the powdered sugar and the chocolate drizzle really made this pop pie fun, delicious and a bit nostalgic. It was the perfect adult breakfast item to help us all relive some of our childhood. I also couldn’t help but get a black & white cakewich as well. Essentially a grown up version of a homemade ding dong. 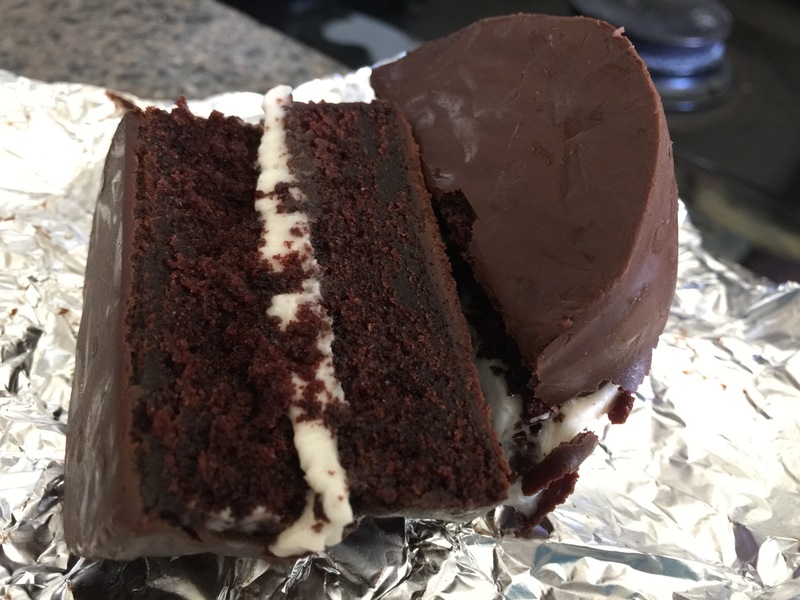 Made using a chocolate cake sandwich filled with vanilla cream, the cakewich contains Valrhona crunchy pearls and the whole cakewich is then coated in bittersweet chocolate. Doesn’t this look exactly like a ding dong, even down to being wrapped in aluminum foil! However, this cakewich was way better than any ding dong I ever remember. The cake is moist and delicious and not too sweet. The crunchy Valrhona chocolate pearls is a nice treat to add a bit of crunch and texture to the cakewich. And the vanilla cream is perfect as it’s not too thick, and not too sweet to take away from the chocolate cake. I also love the bittersweet chocolate coating which is thick enough to add that crunchy layer to the cakewich every time you bite into the cakewich. This is the ultimate nostalgic treat for me and it was perfect. Enough with the other treats though, like I said, what I came here for was the mini layer cakes. I decided to go home with two of them. One for me, one for my husband. 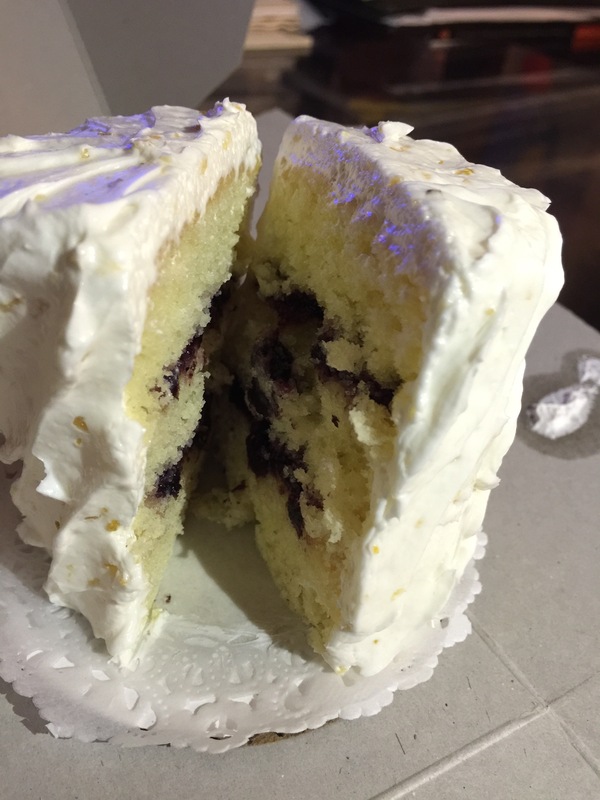 For my husband, I chose the lemon blueberry layer cake. Two items my husband really likes, lemon and blueberry, all rolled into one. Made with lemon cake and layers of blueberry cream frosting with bits of fresh blueberries swirled into the frosting made for such a delicious cake. The outside of the cake was frosted with vanilla buttercream. At first, my husband, who isn’t a fan of cake, wasn’t too thrilled with the fact that I had gotten him a cake, as he could have done without. But, once he tasted the cake, he actually devoured the whole thing. He said that the cake was way better than he expected it to be. 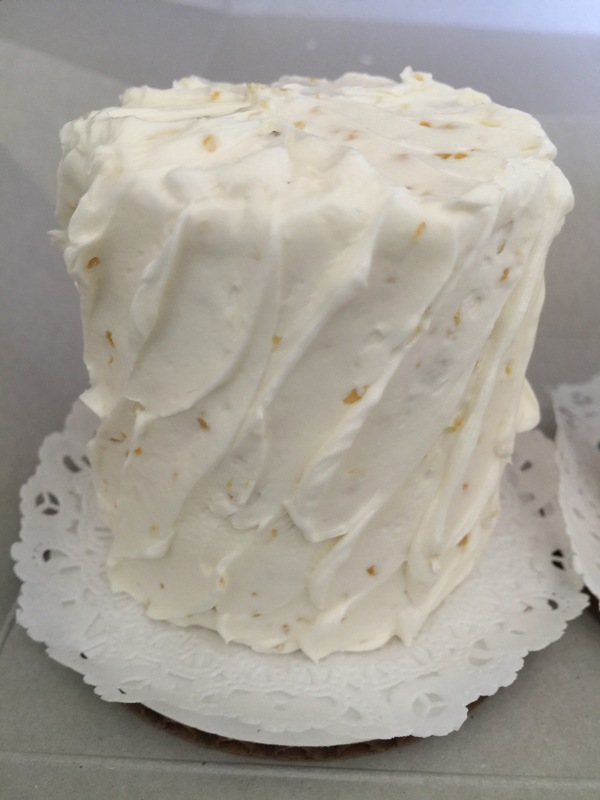 The lemon cake was moist and delicious and was flavorful and meshed will with the blueberry buttercream frosting layered in between. He liked the taste of the cake because it wasn’t too sweet and really tasted of natural flavors rather than artificial lemon and blueberry flavors. The cake was small enough to enjoy without being overwhelming, especially for someone who doesn’t enjoy cake at all. I was so happy that at least in this instance, I was able to win over my husband’s tastebuds. For my own mini layer cake, I chose the confetti cake. 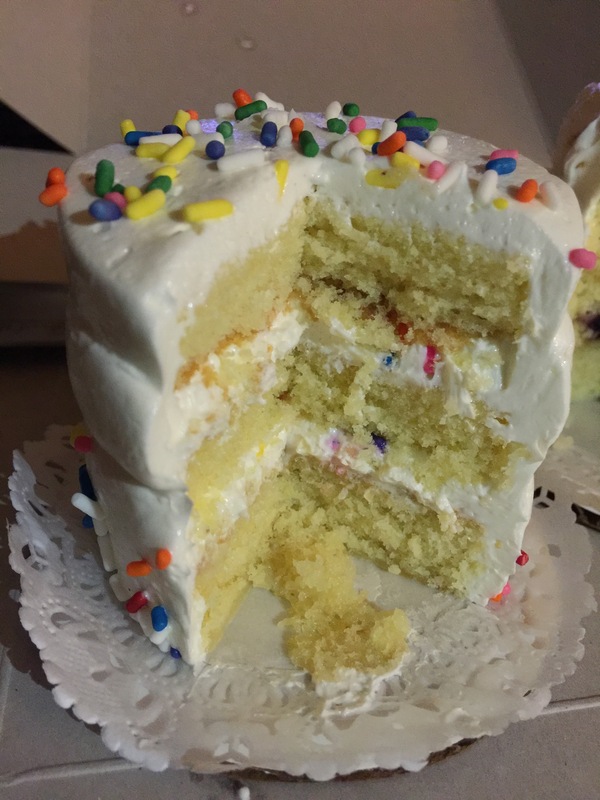 Vanilla cake with rainbow sprinkles and vanilla buttercream is a total nostalgia cake. This cake was so cute, I just couldn’t pass it up. 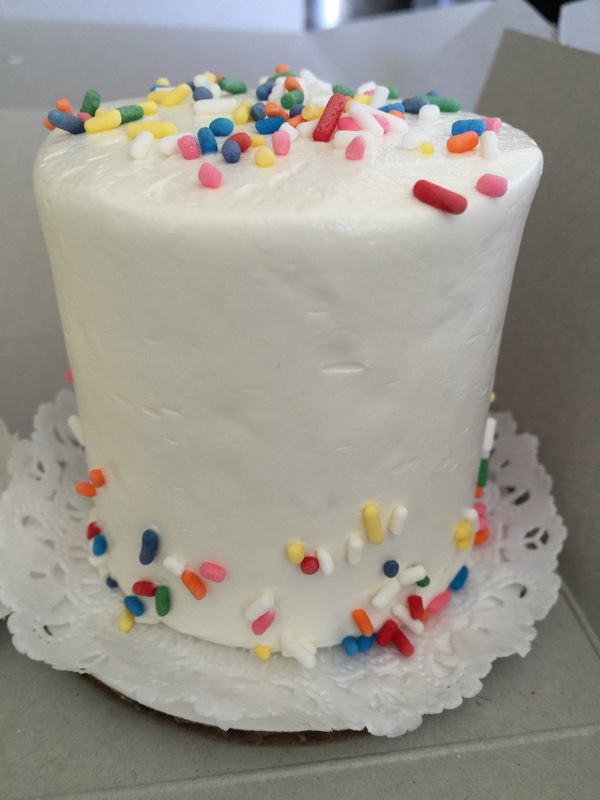 I’m not normally a vanilla cake kind of girl, especially when there are chocolate options, but I love rainbow sprinkles and this is exactly the kind of homemade cake that many of us received for our birthdays when we were kids that I couldn’t resist. This cake was so delicious. The vanilla buttercream is the star of the cake, with the perfect creamy texture, and a terrific taste without being overly sweet. The confetti decorating the outside and the sprinkles mixed into the vanilla buttercream between the layers of cake was perfect as well. The yellow cake was moist and delicious. This was the epitome of the perfect vanilla cake and I absolutely loved it. These mini cakes are also the perfect size as well – small enough to eat without feeling too guilty, but big enough that there’s substance to it that makes you feel like you’re eating more than just a slice of cake. Cake perfection. Of course, since I was already stopping in, and it was early enough, I couldn’t help but order myself some coffee to go with my baked goods. Actually, it was hot outside that day, let’s make that an iced vanilla latte. Strong, sweet and refreshing, this iced vanilla late hit the spot and was all gone before I even made it home with my baked goods in hand. Cake Monkey has been such a hit that my office happened to pick a box of 6 assorted mini layer cakes as a celebration of one of our co-woker’s birthdays a few months back. This was such a hit with people because not only were these mini layer cakes super cute, they are small enough that it allowed people to sample many different flavors of cake. This birthday celebration really went over well in the office. 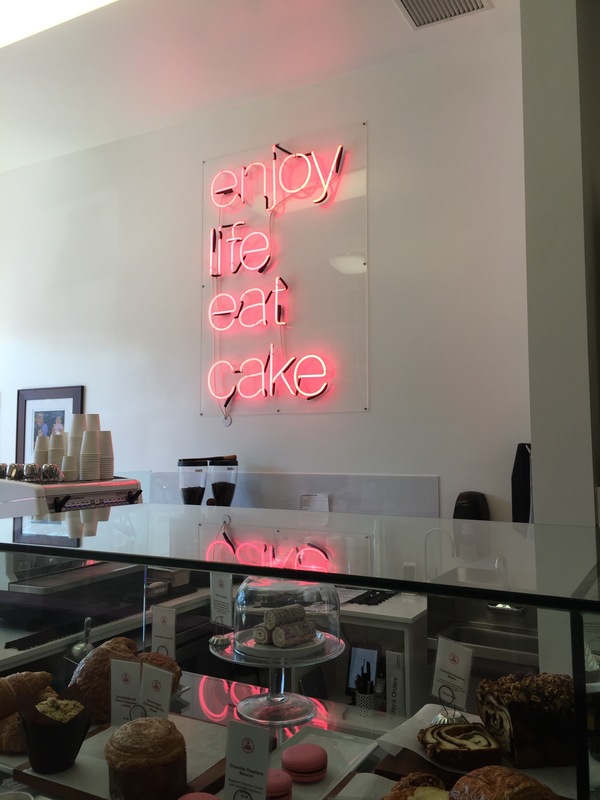 Enjoy life, eat cake is lit up in pink neon lights inside the store and it’s a great motto. What more do you need to put a smile on someone’s face than some cake? Make that a cute, adorable mini layer cake that is just as good as it looks and you definitely can enjoy life by eating cake. Cake Monkey is one of the best nostalgic bakeries I’ve ever seen. They make the most amazing and tasty baked goods that are reminiscent of so many of the sweet treats many of us grew up with. 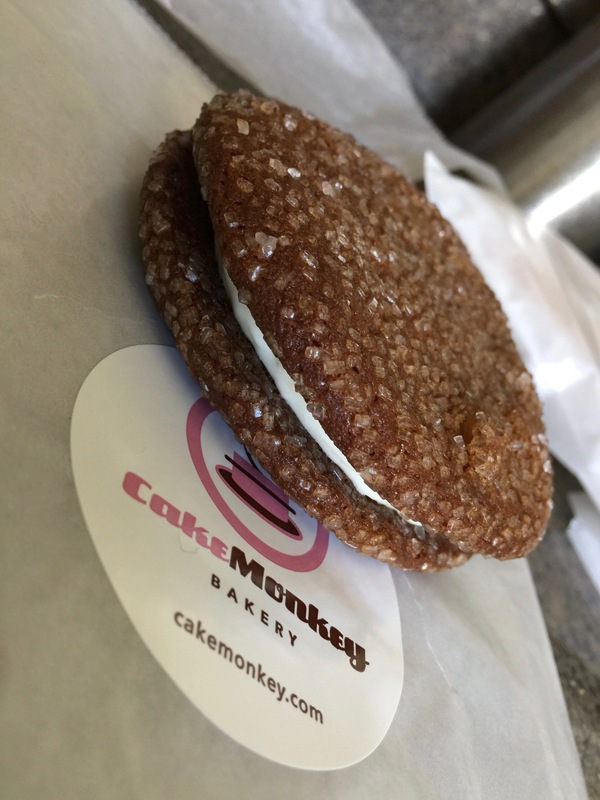 If nothing else, you should go to Cake Monkey for their mini layer cake, but it’s almost impossible to walk out of there with us cake, don’t forget to pick up a cakewich a pop pie and some cookies. Oh, and don’t forget a refreshing, tasty hand crafted cup of coffee as well.